The U.S. Bureau of Labor Statistics showed employment increased by 160,000 jobs, the lowest monthly job gain since September. This is a decrease from March’s revision from 215,000 to 208,000 jobs. The unemployment rate was unchanged from the month prior and held at 5%. 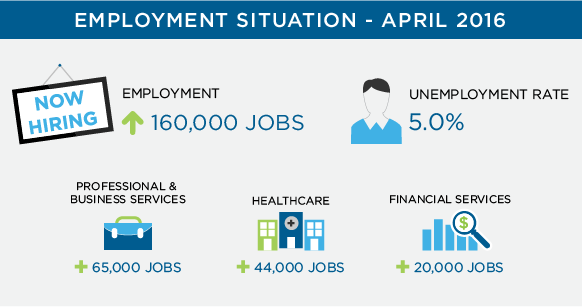 In April, professional and business services added 65,000 jobs, healthcare employment increased by 44,000, and financial activities added 20,000 jobs. Average hourly earnings increased by 8 cents in April, to $25.53, following an increase of 6 cents in March. Over the year, average hourly earnings have risen by 2.5%. Professional and business services added 65,000 jobs in April, with 21,000 of the job gains occurring in management and technical consulting services. Over the prior 12 months, professional and business services added an average of 51,000 jobs per month. Jennifer Ferderer, Account Manager of the Legal Division in Las Vegas, has seen an increased demand for direct hire staffing services for support staff. “In the past, companies would usually start support staff on a temporary to hire basis, but, with the shrinking market, they are willing to hire immediately to ensure they are getting the best possible candidate. Healthcare employment increased by 44,000 jobs in April, with 23,000 of the job gains occurring in hospitals. Over the year, healthcare employment has increased by 502,000 jobs. Employment in financial activities rose by 20,000 in April, adding 160,000 jobs over the past 12 months. Evan Levine, Executive Recruiter of the Finance & Accounting Division in San Diego, commented, “In San Diego, according to CareerBuilder’s Supply & Demand Data Portals, there has been an 195% increase in job postings for Accountants and a 311% increase in finance postings over the past year. While candidates are seeing more opportunities, they need to continue to ask the right questions and ensure a role is the best step in their career. Additionally, organizations need to remain selective in their process despite seeing less qualified candidates available than they’re used to. JC Carrion, Executive Vice President of Workforce Recruitment in Orange County & Los Angeles, is seeing different results than the little change in manufacturing jobs that the BLS reported. “Our Manufacturing & Distribution’s Professional Practice, which focuses on automotive, consumer goods, and medical device, has been seeing an increase in business due mostly to automation. Linda Taylor, Director of Operations of the Manufacturing & Distribution Division in Las Vegas, is seeing a trend of businesses needing multiple temporary employees on an asap basis. April’s low employment numbers should warn companies that the pool of unemployed workers is, in fact, shrinking. With the tight labor market, companies should find gaps in their hiring processes and make necessary changes to find skilled workers more efficiently and effectively. Eastridge Workforce Solutions created the Talent Acquisition Assessment to help organizations assess their current hiring processes and recruitment technology. See the results or contact us to learn how we can help you improve your hiring processes.